Anthem: "Ja, vi elsker dette landet"
Norway (Bokmål Norwegian: Norge; Nynorsk Norwegian: Noreg), officially the Kingdom of Norway is a Nordic country on the western portion of the Scandinavian Peninsula, bordering Sweden, Finland and Russia. 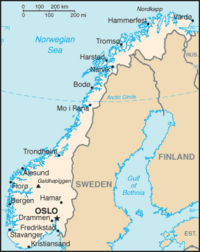 Its capital city is Oslo. 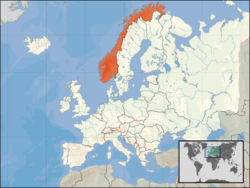 Norway was and independent kingdom up until the death of Haakon VI in 1380. From that point Norway was a part of Denmark. Conquered by Sweden in 1814, a surge of Norwegian nationalism during the 19th century spawned the dissolution of the Norway-Sweden union in 1905, marking the end of more than 400 years of non-sovereignty, with Haakon VII chosen to serve as king. This page was last modified on 1 September 2009, at 14:50.